I have my mom to thank for instilling me with a love of pictures. I might be more into taking scenic shots so as not to worry about eyes blinking shut, movement or missing the action in the frame (all of which have happened when I move away from my thousands of tree, mountain, sunset and water shots), but that doesn't keep me from enjoying all kinds of photos--hers, mine, friends', Flickr's. And that especially holds true with sports action shots from skiing, running and triathlon--you don't want to see me on a bike, trust me. With hours to spare between the seconds I'm spotted on the race course, my mom happily snapped away the below images from the day. 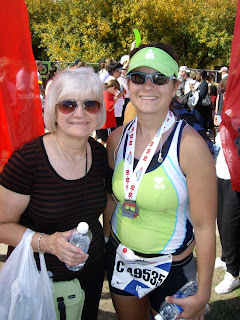 But I'll first kick things off with my pre-race day memories. 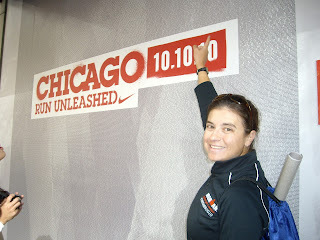 At the expo, you wanted to visit the Nike area to search for your name on the participant wall. And pose for your picture by the 10-10-10 that won't be seen again for another 100 years. My dad and I are walking along the marathon's first mile, heading south toward its Grant Park start. It will look a little different about 30 minutes later when the runners flood the entire street. Affixing my bib...apparently I landed a charity spot for A Running Start (which explains the blue) but the high number was a bit of a surprise unless bib numbers were decided based on when you registered and not alphabetically or by start corral. 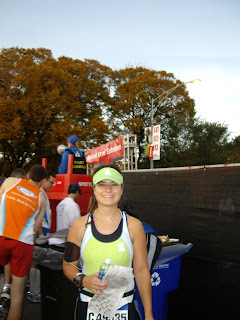 That's me about to go into my start corral. Tip: stand by a garbage can to get ready and stow the gear you won't need until after the race. No one will bump into you, push you aside or say you're in the way. And yes, that's a crossword I'm carrying--helps to distract me before the start. This Brit runs pretty darn fast with two prosthetics. And he made the evening news for a quick interview. 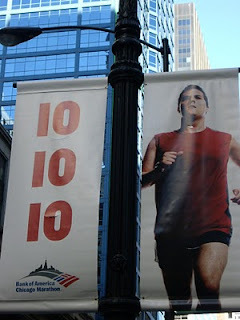 There goes a fast pack of runners about to cross over the Chicago River at the Sears--oops, I mean-- Willis Tower. I'm running with the rest of them approaching the halfway mark. Check out the 2010 banners, featuring a collection of inspiration runners, that have adorned the city lampposts for weeks. That's me with the photographer after I finished No. 11 and hustled over to Runner Reunite. I couldn't close the books on Chicago 2010 without getting my medal engraved at Niketown on Monday (free for Nike+ users who picked up their lanyards at the expo or for runners who purchased finisher's gear) and finding my name on the storefront's windows. My name's up there I swear--I have the poster (another freebie for Nike+ users) to prove it. For more race day pictures, Time Out Chicago was on hand to create a few albums as was Raymond Britt, a photographer and writer I worked with back in the day of Windy City Sports. Or if you ran, don't forget to search for your on-the-course pics at marathonfoto.com. Do you have pictures to share? Send us your links!